Here is one of the albums that totally introducing me into electronic music when I was 14 years old, a moment or we look has to be different other one and this music reallyy changed my life. 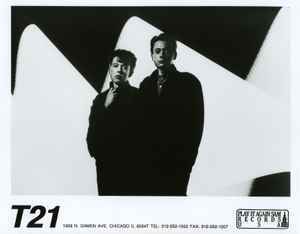 Judging by one of their pictures shown on Discogs, its easy to think that T21 (duo of Philippe and Herve Lomprez) are yet another cheesy new-wave act from the 80's. Their records, however, tell entirely different story - while they're not totally devoid of pop elements, there are many experimental pieces many of which still sound fresh, in my opinion. From what i can understand, Trisomie 21 just recently started to get attention outside of their native France and its about time, since they reformed after a long hiatus and recorded an entirely new album called "Happy Mystery Child" which may or may not tone down ambient/experimental influences in their sound.